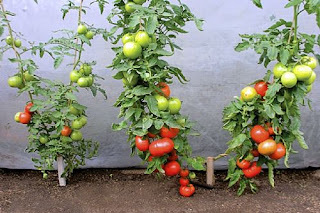 How to plant tomatoes may seem easy, but to be able to grow those tomato plants that can give you abundant red tomatoes are not as easy as it seem. Generally the start of the seed should about 6 to 8 weeks before the spring frost starts to arrive. The best time to start planting the seedlings is two weeks before the expected first frost. 1. Prepare a well moistened container. Make a shallow furrow in the dirt that has been placed in the container with a chopstick or pencil. Drop the tomato seeds in the furrows. 2. Pinch together the seeds gently to cover the furrow and then water it. Place this container in a warm place, but once they germinate, it is time to move them into the place of strong light. 3. By day 30, it is time that you can see the first tomato leaves as they begin to appear. This is the sign that you will need to move them into individual containers so that they have enough room to grow properly. 5. Use only a good potting mix that is well moistened so that the seedlings can grow healthily. 6. When the weather has started to warm up and spring has come, the new plants have grown to be fully rooted. As the weather has gotten better, it is time to move the plants outside so that they can get direct sun light for at least a few hours a day. After some time, they can get the sun to shine on them all day long as they have been hardened off by the gradual exposure to sun. 7. By the time they are used to the sun, you can again transfer them to the outdoor soil by removing the entire root in the pots. This way, you can make sure that the roots are not broken. 8. Settle the tomato seedling in the hole that you already made in the ground and make sure that all the stem area is covered up to the area where the branches begin. 9. Water the plants gently and put tomato support when necessary.